« The Orange or the Green? I can’t imagine celebrating Saint Patrick’s Day without a little soda bread, so called because it gets its leavening from baking soda rather than yeast. This is my favorite recipe to date for this treat. It comes from a now defunct store in Summit, New Jersey, called the Irish Cottage. 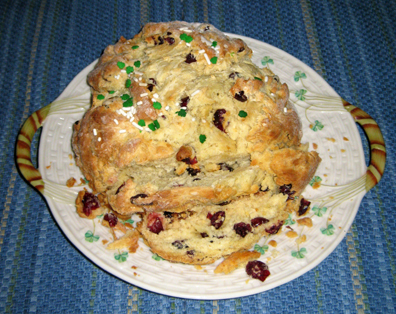 Every year the store had a soda-bread contest, and this was one of the staff’s favorite winning recipes. If you don’t have a way to use a quart of buttermilk, you may buy buttermilk powder in the baking section of large grocery stores. Add the required amount to the flour, sugar, salt, and baking powder, and use water when the recipe calls for the buttermilk. Preheat the oven to 375 degrees. Grease a large cookie sheet or line it with parchment paper or a silicone mat. In a bowl, combine the flour, sugar, salt, and baking powder. With two knives or a pastry cutter cut in the butter. When you are finished there should be only tiny bits of butter left. Add the cranberries. In separate bowl (or a 2-cup measuring cup) mix the egg, buttermilk, and baking soda. Combine them with the flour mixture, stirring just until the dry ingredients become moistened. Form the dough into a ball. 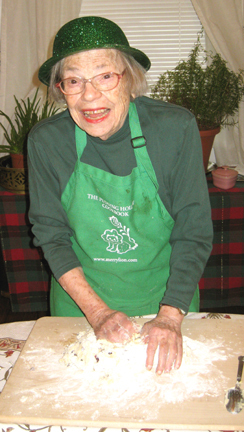 On a lightly floured wooden board knead the dough for 3 to 5 minutes. Form the bread into two mounds, place them on the prepared cookie sheet, and gently make a cross on the center of each mound with a serrated knife. Add a few sprinkles if you like. Bake the mounds until they are golden brown in spots, about 35 to 40 minutes. Jan and I wish you a happy Saint Patrick's Day! This entry was posted on Tuesday, March 17th, 2009 at 4:26 am	and is filed under Breads, Muffins, and Scones, Holiday Foods. You can follow any responses to this entry through the RSS 2.0 feed. You can leave a response, or trackback from your own site. In the South, we can purchase buttermilk in pints! Very useful. Useful indeed, Ellen. Fortunately, my mother loves the stuff so she’s always good for finishing off a quart. But we Yankees could use the pints just in case we don’t have mothers like mine (or they’re out of town). And thank you, Judy and Andrea. I couldn’t agree more that she is pretty darling. LOVE! the photo of JAN! !